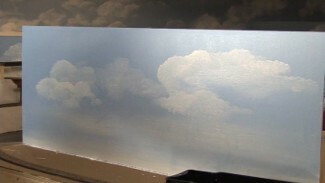 Next in our discussion of methods that add intrigue to a large horizontal portion of a model railroad, we look at ways to increase the dimension and depth of a scene. Previously, we showed you some of our favorite techniques for making small changes to the layout that improve spacing. Now, we’ll insert model railroad accessories that improve the vertical elements of the scene and distract from the fact that the scene is, in fact, entirely horizontal. In this lesson, NMRA Expert Modeler Gerry Leone demonstrates a number of expert techniques that utilize scratch-built and commercial model railroad accessories perfect for expanding the dimensions of a scene. The best way to begin increasing the dimensions of a horizontal scene is to look for locations where model railroad accessories fit into the scene. For instance, Gerry first shows you how to utilize reduced-depth buildings and puffball trees along the backdrop to give your scene greater depth and realism. Puffball trees are made from polyester fiber fill and hairspray, and Gerry demos a couple different techniques you can use to make the treeline appear more realistic. 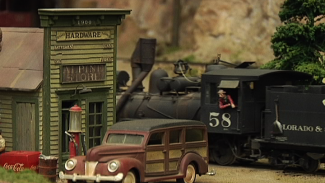 Next, Gerry teaches you the best way to quickly and dramatically increase the verticality of your scene with straight-lined model railroad accessories that make sense for their surroundings. As an example, the scene Gerry is working is centered around a factory, so he introduces a few tall vertical model railroad accessories well suited for a factory setting. Finally, he shows you how to space out some additional model railroad accessories that make sense to be found along the tracks in an industrial town, including telephone poles and water towers. With these methods for implementing model railroad accessories, you’ll be able to take a flat layout with little to boast and turn it into a visually appealing scene that holds the attention of your viewers. Great idea on the puff ball trees. Never seen that before and I will be sure to incorporate that into my layout soon. Like all the ideas about the vertical elements as well.